After being a subscriber to Loot Crate for nearly 2 years (and watching their quality diminish recently), my wife and I decided to try out another couple crate subscription services. We wanted to keep getting stuff every month like with Loot Crate and set up 1-month subscriptions with a couple to see what was out there. The first this month comes from Geek Fuel, a newer service based here in Denver that has grown pretty big over a short time. A mystery Doctor Who item was what led us to give it a go, as we are both big Whovians. So, was it worth it? Does Geek Fuel put out a quality package? Let’s find out. The notable franchise included this month were the aforementioned Doctor Who, Alien and Ghostbusters. It wasn’t specificied which version of Ghostbusters merchandise we would be getting, so I was a little hesitant there. In fact, let’s just go ahead and start with that item. 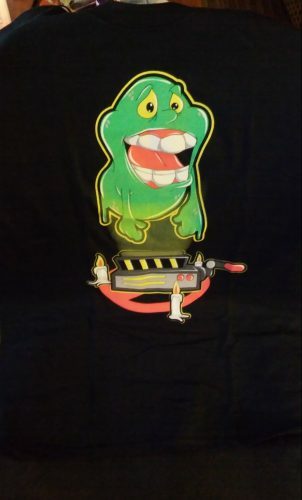 Pretty decent fan-designed Slimer shirt. A little on the cartoony side compared to some of the designs I’ve seen, but still nice. My wife claimed this one pretty quickly, which is fine. I got what I think a better shirt in this month’s Nerd Block (more on that in another article). 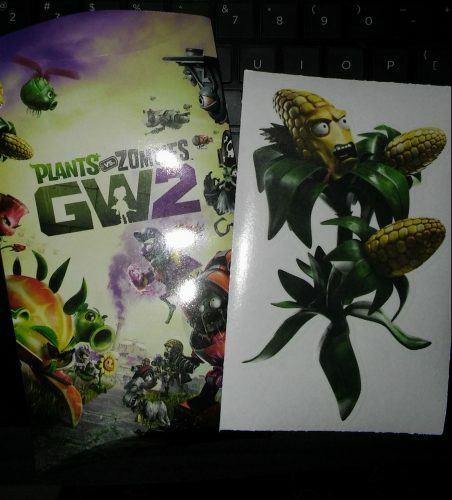 Up next is Plants vs. Zombies: Garden Warfare 2. This is a wall cling, so it’s reusable. Unfortunately, my walls aren’t really good for stuff like this, and I’m not much of a fan of the franchise, either. I don’t know what I’ll do with this at the moment. Anyone out there familiar with Badland? I’m sure not. 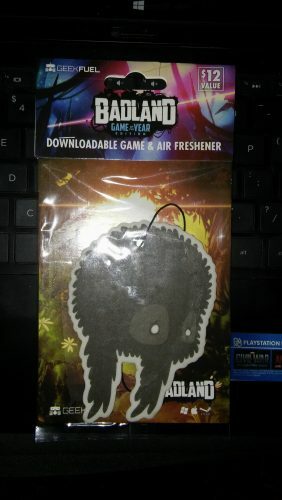 This is a car air freshener with the added bonus of a download code for the full game on Steam. I know nothing about this game and had never even heard of it until now. A free game is still nice, but it doesn’t sound like my cup of tea from the description on the back. Plus, I have no car. Strike 2. 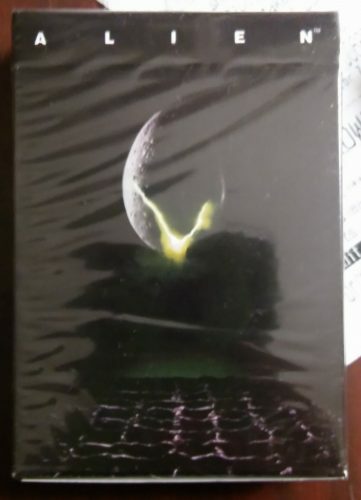 …and it’s Alien-themed. 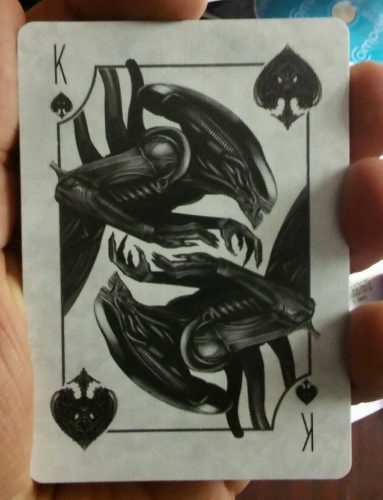 I like Alien and I like playing cards, so we’ve got a good item here. 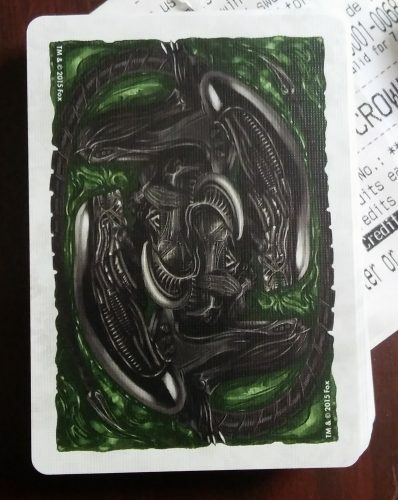 The artwork on the cards is really cool as well. 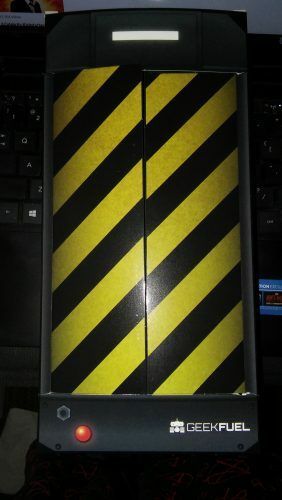 The fronts and backs feature new art from the franchise and have a nice finish. Example of one of the card faces: The King of Spades. Now, if you’re familiar at all with these subscription boxes, you’ll know most of them come with some sort of exclusive button every month. Turns out Geek Fuel is no different. Fortunately, we collect buttons in this household. 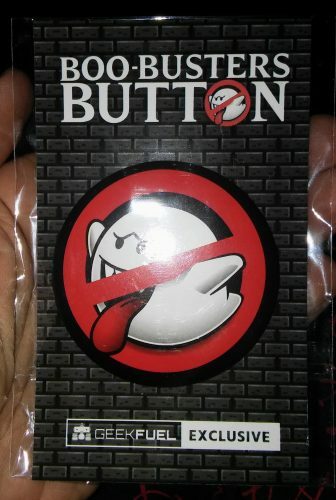 Boo from Super Mario Bros. crossed with Ghostbusters? I can dig it. Finally, we have Doctor Who. Geek Fuel seems to do a lot of DW items from what I’ve seen (which is fine), so we were very curious to see what timey-wimey goody we got this month. How about that. 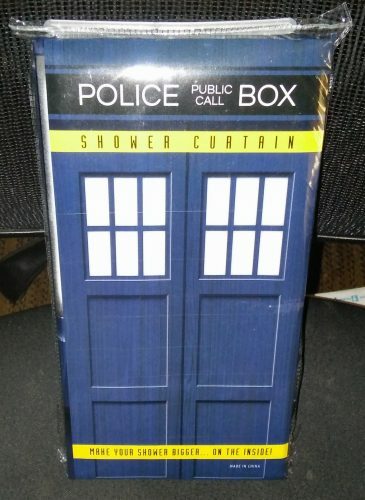 A shower curtain. This might not be the coolest thing out there for some of you, but I’m very pleased. By sheer coincidence, the Mrs. and I were talking about buying one of these the night before. Welp, Geek Fuel took care of that! I think this is really cool and will look nice in the bathroom once we get it up. Overall, this first foray into Geek Fuel is pretty good. Only two items out of the boxes were “meh” for me, and they weren’t even that bad, so I have little to complain about. It wasn’t perfect, but the good stuff in here is worthwhile, so I think I’ll stick around with them at least another month or so and see how it goes.